Daniele Vega, whose movie “A Fantastic Woman,” won Best Foreign Film, was Oscars’ first-ever transgender female presenter. 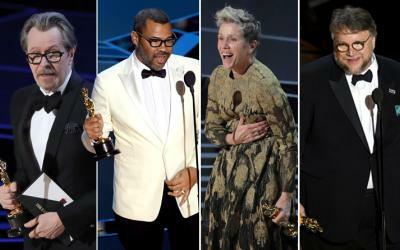 As for the big awards, I was happy that “Get Out” didn’t win best picture, although its writer/director, Jordan Peele, made history with his screenplay win. “The Shape of Water” won the big prize, as well as best director for the quite-eloquent Guillermo del Toro. Mexicans have won the directing prize four of the past five years. It was a good night for Mexico in general: “Coco” won best animated feature and best song, although that song was croaked by the generally attractive Gael Garcia Bernal. In spite of all the shout-outs to diversity and #metoo, Oscar still managed to give statuettes to woman abusers Kobe Bryant (for a short film) and Gary Oldman, as best actor, for “The Darkest Hour.” Plus ca change…As for Rex Okpodu, LW’s Oscar predictor, his forecast was very respectable. Of the major awards, he missed only foreign film. Oscar Producers Plan A Snoozefest?